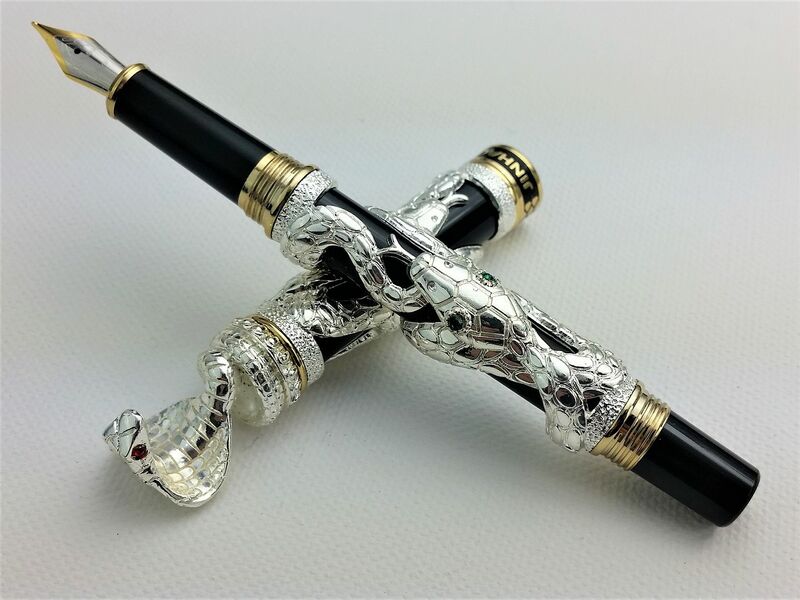 The JINHAO Cobra fountain pen is a truly stunning pen to behold and use. 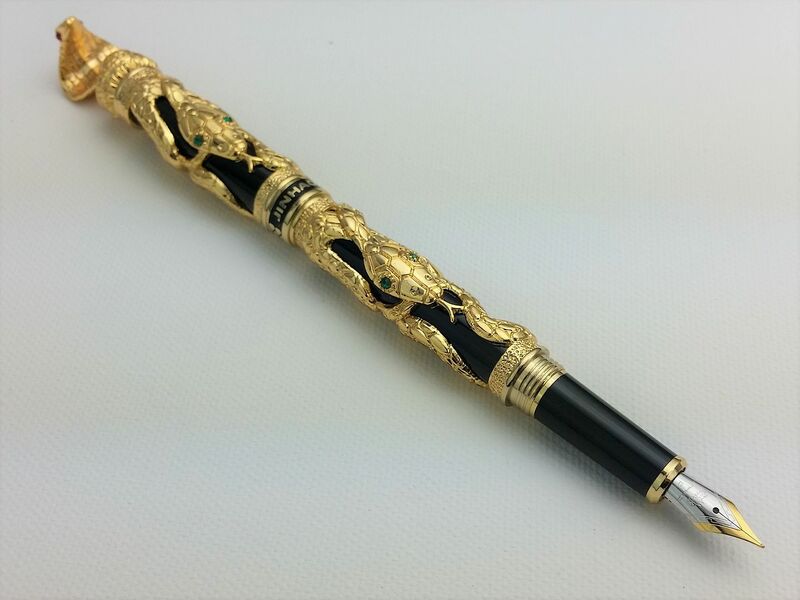 Made of solid lavishly sculpted brass, depicting twin gem-eyed snakes, a detailed cobra head finial atop a screw on cap and a high quality fine two toned nib, this eye-opening, jaw dropping pen is sure to impress. The construction is solid, sculptured brass, with gold coloured steel trim. Weighing in at 90 grams, the sturdiness and solid build of this pen is easily recognised in its weight. It includes numerous imitation gemstones and embossed details, included a gorgeous snake's head finial and a beveled central ring. The grip section is smooth and slightly tapered, making this pen very comfortable to write with. Uncapped the pen only weighs in at 43 grams, so it is still very usable for long periods. The cap thread sits neatly below the finger level and does not impede comfort. The nib is a two-toned gold and silver size 5 fine nib, in steel with some minor element of flex. As it is a size 5, it can also be swapped out with similar sized nibs from other manufactures. JINHAO nibs are renowned for having a noticeably buttery smoothness to them, and are a genuine pleasure to write with, despite their affordability, and the Cobra does not drop the ball here. The cap is also made of solid sculptured brass with imitation gems in the snake's eyes and a lavishly detailed cobra's head, and a beveled central band. The cap can be screwed onto both the top and base of the pen. This pen looks amazing capped, uncapped and posted. The converter, which all of our pens come with, is very easily operated, holds a considerable amount of ink and is easily cleaned and maintained. The whole pen can be disassembled and cleaned. This quality fountain pen also comes with a beautiful, sturdy black faux leather gift box, with embossed logo and white stitching that gives the pen a feel of value and sophistication. The white stitching around the edge stands out beautifully and the soft padded interior is very pleasurable to both see and feel. 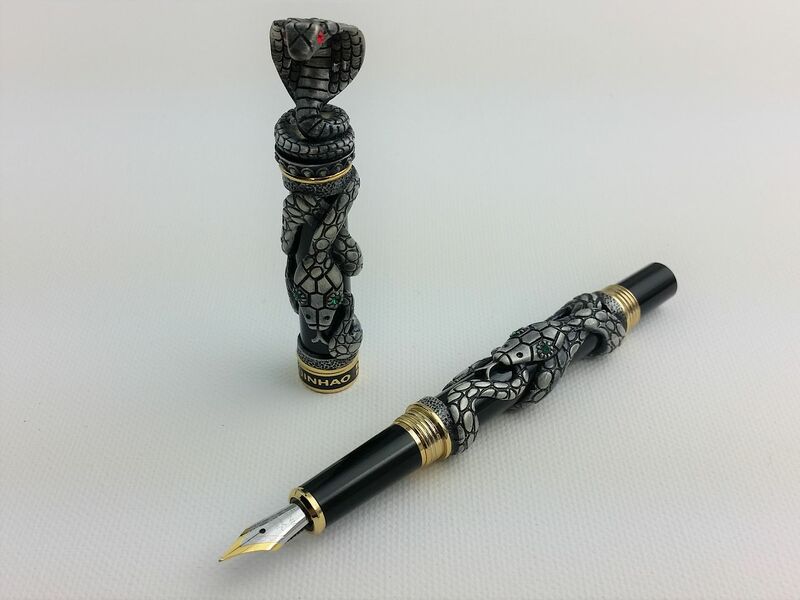 All in all, the JINHAO Cobra is a sturdy, elegant and pleasurable pen to both display and use. It is comparable in quality to other models that can cost hundreds or even thousands of dollars, but at an insanely competitive price. We at JINHAO Pens Australia are proud to provide it for you today.